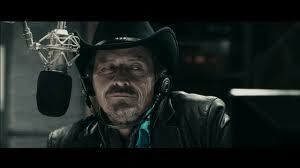 This week I finally got the chance to watch the 2009 Canadian zombie film Pontypool. For the past couple of years, it had become this sort of Flying Dutchman on my radar. People I knew had viewed it– and were uniformly raving about it– but nobody could tell me exactly where or how I could see it for myself. It still has no release date on Netflix, and I’ve never seen it for rent or sale in a store. (It is, however, now available on Amazon.) Eventually, my buddy Brendan Riley from the ZRS—who has written his own trenchant thoughts about Pontypool here—gifted me a copy. Pontypool is the tale of a zombie outbreak localized in the small town of Pontypool, Ontario, Canada. It is told from the perspective of a morning radio DJ beginning his shift. The three main characters are the DJ, his program director, and their young assistant. It's easier to stomach news of a zombie outbreak when it comes from a guy in a cool cowboy hat. At zombie/horror conventions, a frequent topic of conversation is how much (if at all) a zombie ought to be able to speak. Must it say nothing? Can it moan? Can it say “Braaaaaains” or “Send more cops…”? Can it perhaps manage the names of people and places it once knew in life? 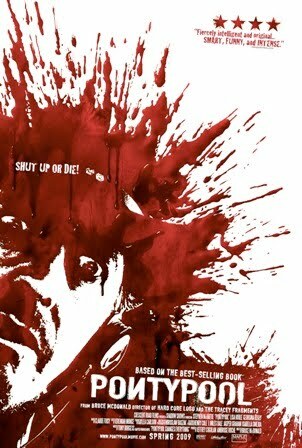 Pontypool daringly challenges this entire paradigm of thought by imagining a zombie virus that is transmitted via the medium of speech itself. Just as a biological virus requires an organic host in order to become fully alive, so must the word-virus in Pontypool transmute humans into gibbering, repetitive husks in order to fully come into being. This, for me, was the central and scariest aspect of Pontypool: Muttering zombies, not as an ultimate end, but as a gateway to…something else. Something coming in from beyond, using zombies to become alive. Pontypool is clearly influenced by the work of Neal Stephenson. Dr. Riley has already observed this (and I thought I espied a Neal Stephenson book in the radio station where the film is set). I also think the film evokes Orson Welles’s War of the Worlds inasmuch as a central dilemma of the protagonist is that it’s his job as a DJ to tell people what’s going on, but he himself has only the foggiest notion of what is actually transpiring outside his studio. Reports that come in are as foggy as they are disturbing. Ought he to trust them? How long should he wait before using his medium to raise alarm? The tension built by this dilemma is palpable, and keeps the film engaging. 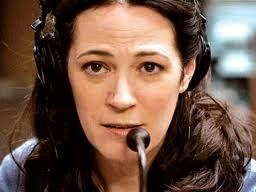 "We can't have any dead air. . .there are literally TENS of people listening to this broadcast!" Despite these reservations, I still think Pontypool is an important and unique zombie film that’s definitely worth your time. It’s scary, clever, and original. Moreover, by turning the notion of zombie speech on its head (by making speech itself the medium of a zombie virus), it has opened exciting new narrative possibilities for enthusiasts of the walking dead everywhere. I caught it about six months ago on Showtime ot Starz in the middle of the night, not knowing what it was about but looking for something different to watch. Your review is dead-on (pun intended) about the problems with the film and script, but overall it was an enjoyable movie that was different from any other zombie tale I’ve watched. Thanks for the review. I am always on the look out for a new Zombie movie/series/anything. I tend to agree with you. This is a zombie film that isn’t for everyone. It brings a unique, and needed, concept to the horror genre, but doesn’t bring the expected carnage. But I think that’s ok. I like it when a horror movie comes along that feels real with characters that have depth. I’ve had enough of early 80’s stereotypical characters in grind-house horror flicks. I also got the chance to review this film on my new blog. I’m just getting started and would love some feedback from a critic. Check it out if you can.